Pope Francis told the Italian and Argentine soccer teams on Tuesday that he could not decide who to back in their friendly match on Wednesday, but he urged them to set a good example in their behavior on and off the field. “It’s a bit hard for me to decide who to support,” Francis, an Argentine whose parents hailed from northern Italy, said in an audience with players and officials at the Vatican ahead of the fixture, which has been organized in his honor. “It’s a good thing it’s a friendly, and make sure that it really is,” the pontiff told the two sides who will play at Rome’s Olympic Stadium in their first meeting in 12 years. 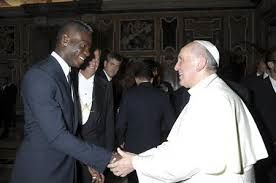 “You might not realize it but for so many people who look at you with admiration you are a model, for better or for worse, so be aware of this and give an example of fair play, respect and altruism” said the former Archbishop Jorge Bergoglio of Buenos Aires, who is an avid football fan. “Here in the Vatican they tell me off for being undisciplined,” joked Francis, who is known for breaking with stiff Vatican protocol. His audience included Italian striker Mario Balotelli, whose volatile character has got him into trouble in the past, but who will miss Wednesday’s match because of a knee injury. There had been speculation that the Pope would attend the match, which is the pick of a crop of international friendlies on Wednesday, but Italian coach Cesare Prandelli said Francis had been advised against it by his staff. Argentine captain Lionel Messi, who will also miss Wednesday’s game with a muscle strain, said it had been “a very special day, unforgettable.” He was due to fly back to his Barcelona club after the audience. Italian goalkeeper Gianluigi Buffon said he hoped the two sides, who have won six World Cups between them, would meet again in the final of next year’s tournament in Brazil.